As artificial intelligence (AI) tools flood the market, physician efficiency and document clarity have been sacrificed in exchange for EHR big data input and a workflow designed to prompt revenue cycle triggers. 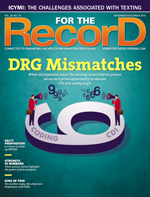 Between underdocumented cases caused by time-consuming document creation workflows or "note bloat" caused by overuse of copy and paste and generic content generating tools, too many of today's records do not deliver clear condition-specific details for optimum patient care, let alone accurate reimbursements. Earlier this year, Health and Human Services and the Centers for Medicare & Medicaid Services hosted a symposium in Washington, D.C., to address this growing problem. Promoted as a public meeting on reducing clinical burden, the meeting focused on SEC. 4001 of the 21st Century Cures Act, which calls for assisting doctors and hospitals with the growing problem of documentation overload. Highlighting these concerns, a September 2017 study by the University of Wisconsin and the American Medical Association noted that physicians work an average of 11.4 hours per day when on duty, with 5.9 hours spent directly engaged with their EHR. The negative impact of this data-driven workload has been qualitatively voiced in numerous articles, including a New York Times Magazine editorial titled "How Tech Can Turn Doctors Into Clerical Workers." Although there will always be a balance between technology and human effort to create and process medical records, there have been few efforts to quantify automation's impact on quality. There also has been no effort to quantify the complete financial impact of AI tools, which are often cost-justified through labor-eliminating bullet points that focus on limited process steps. The AHIMA standards on document quality apply equally to reports generated through traditional (dictation/transcription) and fully physician-centric means (front-end speech, self-type, and/or point and click), as well as some combination of both (partial dictation). Two independent peer-reviewed studies analyzed the quality impact of physician-centric workflows with both reflecting parallel results. "Error Rates in Physician Dictation: Quality Assurance and Medical Record Production" appeared in JAMA Network Open in November 2014, and "Analysis of Errors in Dictated Clinical Documents Assisted by Speech Recognition Software and Professional Transcriptionists" was published in the Journal of American Medical Association in July 2018. Both show when transcriptionists or speech recognition editors are involved, the signed document error rate is 0.3%. Without them, error rates averaging over 7% are pushed into the EHR. Although front-end speech vendors tout AI improvements, such as warnings when gender or other patient reference inconsistencies are recognized during document creation, the cause of most physician-centric workflow errors is "time," specifically the time needed to simultaneously dictate, read, and edit documents before signing, which can result in physicians not proofing their own work before electronically signing. This thought-process change from dictating a note from start to finish and later reviewing a complete document to simultaneously speaking, reading, and editing while interacting with a structured user interface can alter the content physicians contribute. Looking beyond the personal financial loss of physicians, who have reported losing as much as $100,000 per year in some specialties due to the increased time spent with the computer instead of patients (this also affects the per-provider gross revenue potential of health care organizations), the real damage comes from the abbreviated, bloated, or erroneous patient encounter details generated on the front end of the documentation/revenue cycle process. As physicians are overwhelmed with data entry tasks and pressed for time, the comprehensiveness of the encounter details to support ongoing care suffer in exchange for big data content capture and a workflow focused on revenue cycle triggers. The elephant in the room with that shift is the lost patient encounter nuances that directly impact quality of care, downstream coding efforts, and, ultimately, justifiable billing amounts per claim. Vendors may argue that clinical documentation improvement (CDI) or note reader programs are the fail-safe backdrops to ensure content integrity, but those programs are designed to second guess the physicians to fill in the blanks and drive more billing, which can lead to upcoding, such as the $188.1 million in overcharges identified at Providence Health in Renton, Washington, this August. Those incessant prompts also lead to notification fatigue, followed by increased training and additional HIM support efforts to resolve issues, whereas more natural content on the front end minimizes those issues and restores richer detail that positively impacts both patient care and justifiable revenue. Certified EHRs fundamentally transformed the document creation process from a somewhat free-form narrative effort (work-type templates to ensure consistent and comprehensive content) to spreadsheet generation tools. This congressionally mandated objective shift was required to demonstrate meaningful use of captured big data in hopes of impacting overall population health. This is also when physicians and HIM professionals lost their pragmatic voice of reason in favor of IT-designed workflow. Given the federal EHR mandate, per-provider reimbursement incentives, vendor assurances of preprogrammed quality, and HIM labor reductions in favor of automation tools, it was inevitable that CFOs and CEOs would shift the documentation workflow scheme responsibilities away from HIM and to the CIO. Once systems were installed, HIM was called on to fix—or blamed for—any resulting revenue cycle gaps. There was extensive testing to ensure documents created through the EHR environment would generate equivalent revenue if the same cases were processed the old-fashioned way. However, those tests began with the previously content-rich document samples, not the abbreviated thoughts targeting measured data requirements that physicians inevitably (and predictably) settled into to minimally comply with system expectancies and the increase in documentation time. Physicians were then blamed for not providing enough revenue-generating details, and tech vendors did their best to respond with even more automation tools and AI offerings. Unfortunately, the effort required to fully document anything other than generic cases still exceeds earlier documentation methods. Now, when more complicated cases occur, physicians are left with the choice of spending more time in the EHR or surrendering the diminishing incremental bump in personal income that more time on the keyboard may deliver in exchange for seeing other patients. Admittedly, AI demonstrations can be awe inspiring. Unfortunately, by definition, they are conducted in controlled environments with limited variables, specifically staged to maximize the wow factor of the problems they contend to solve. They are not real-life daily operations. Accordingly, the objective must be to allow physicians flexibility and be sensitive to their concerns. They know what works best for them. Continuously throwing more training and technology at them inevitably wears them down to follow the undesirable but prescribed path, even if it means surrendering more of their time and income. The reality is we have passed the saturation point for physician technology tools to generate clinical documentation. With each added structured input step or potential AI warning, providers are being forced to figure out how to game the system so they can get back to their patients. This causes the quality of documentation for ongoing patient care and revenue cycle management (RCM) to suffer. As an industry, it's time to acknowledge that physician efficiency leads to richer content, better patient care, and improved revenue results. To quantify the true financial impact of AI, HIM can review organizational and per-physician historical case mix financial results and compare those numbers against national and regional averages. If there's been a negative slide or more doctors are required to generate the same amount of gross revenue as in years past, the applied AI is more artificial than true. To restore per-physician case complexity and overall revenue results, the focus must be the same as that found in SEC. 4001 of the 21st Century Cures Act: improving quality of care for patients by addressing the growing problem of documentation overload. The age of meaningful use and per-physician incentives is over. Now is the time to maximize physician efficiency at the point of document creation to ensure optimal clarity for ongoing patient care and justifiable revenue. AI tools should be focused on supporting RCM efforts under coding and CDI, where they improve detailed charge capture, especially when, like the original EHR parallel track RCM testing, the process begins with accurate document input on the front end. When certified EHRs were first mandated, oversight of clinical documentation creation was reassigned from HIM to the CIO. Now that the dust has settled, however, the damage done to per-encounter revenue has many organizations thinking RCM executives will have to be the ones to clean up the mess and right the ship. The problem with that approach, however, is that RCM teams work backward from key performance indicator results while the problems that need fixing are occurring at the front end of the workflow. A traditional quality assessment in compliance with AHIMA's clinical documentation standard, which applies equally regardless of the document generation method, can solve this problem. And although this will only identify the problems generated under the current document creation workflow (as opposed to identifying all that is potentially missing), it offers a quality gauge of an organization's process output. Any vendor that suggests transcription will or should disappear due to improvements in front-end speech AI are doing so based on how proud they are of their technology more than from taking into account physicians' time and the volume of errors that get pushed downstream. Although comparative time and error volumes vary by physician, organizations would be well served to check the math for quality on the front end of the document creation process and the added costs for coding and CDI efforts on the back end by physician and by specialty. When the impact of the diluted document details for more complex cases is added to the reduced per-physician revenue, the true cost of forcing AI solutions equally throughout the entire organization may not be worth it. Speech recognition and AI work well in many scenarios and will continue to improve as technology advances. However, the most effective way to accurately and efficiently capture the full health story will continue to vary based on individual providers, their specialties, and the specific technology products being used. Ignoring the gap between where AI tools help and where they hurt is financially irresponsible. True intelligence is knowing when and where to use the tools at your disposal. It's backward, expensive, and ineffective to try to cure poor document creation through after-the-fact coding and CDI prompting. It's like the industry forgot everything it learned with Six Sigma and Lean. It's time to document—by provider and by specialty—the true cost of AI for the complete range of providers. Those are the numbers the C-suite needs to make intelligent business decisions. Improve physician efficiency and business operations will do likewise. — Dale Kivi, MBA, is vice president of business development for FutureNet.